Racing Cat-Back Exhaust 08-14 Dodge Challenger 6.1L, 6.4L Racing Cat-Back Exhaust 08-14 Dodge Challenger SRT8, Racing SUM-640760 Exhaust Kit, Racing exhaust System, Dodge Challenger 6.1L Racing exhaust System, Dodge Challenger 6.4L Racing exhaust System, Dodge Challenger 6.1L exhaust System, Dodge Challenger 6.4 [SUM-640760 Exhaust System] - $400.95 : 3rd Strike Performance, Your Source for Late Model MOPAR Performance Parts and Accessories! 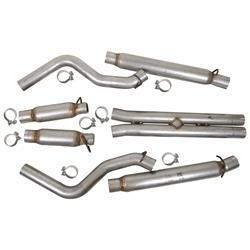 These Summit® exhaust systems have a great sound and make additional performance at a great price. They come in different sizes and for different vehicles.